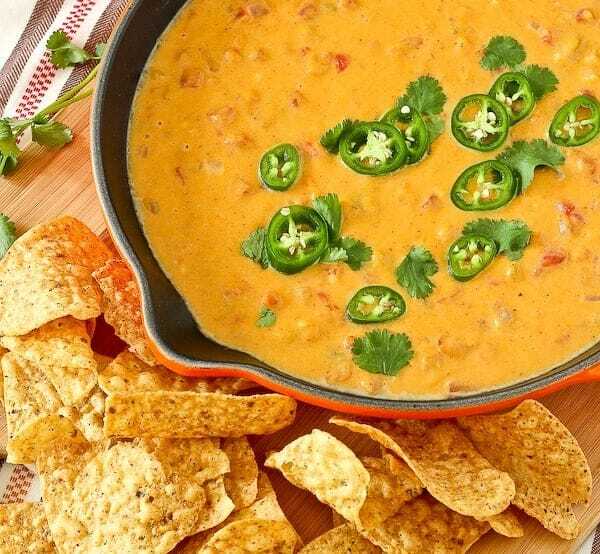 This healthy queso dip is about as healthy as you’ll get when it comes to a decadent, cheesy dip. You’ll love the subtle sweetness and vibrant color that the butternut squash adds. This one is a must-try! I swear, chips with any type of dip = my kryptonite. I recently made another batch of my restaurant style salsa (this time I added green chilies because I didn’t have any jalapeños), and I literally cannot stop eating the stuff. It’s a pretty dangerous situation. If only chips were calorie-free, you know? This healthy queso dip was no different. Does anybody think it’s weird to add butternut squash to queso? I want to hear from you and then I want you to try this recipe and see that you’re wrong. My neighbor Julie, who tests many of my recipes, initially scoffed at the idea of a healthy queso dip using butternut squash. I convinced her of how delicious it was and she agreed to try it. But then we ate it all before I could bring it to her house. So neighborly of me, right? So the verdict is still out with Julie, but I can tell you that Ben and I love this stuff. If you aren’t looking for the flavor of the squash, you may not even taste it amidst the Tex-Mex spices, tomatoes, green chilies, and creamy Monterey Jack cheese. And for those of you out there who don’t really care for making a roux and sloooooowly adding milk, this recipe is for you. It’s basically fool-proof. Bonus: If you have kids that don’t love vegetables, I bet they’ll devour this beautiful healthy queso dip without a second thought. Place unwrapped squash in a microwave safe bowl and heat in microwave for 5 minutes at 50% power or until thawed. Meanwhile, heat oil in a large saucepan over medium heat. Add onions and cook for 4-5 minutes or until translucent. Add garlic and cook for one more minute or until fragrant. Add squash, tomatoes, cumin and chili powder, and bring to a boil over medium-high heat. Verdict: Holy yum. I couldn’t get enough of this healthy queso dip. 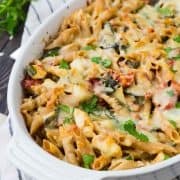 Husband’s take: I’m not actually sure Ben has tried this with chips but I did use the leftovers in an unique way when I was grasping for dinner ideas one night. I cooked some diced chicken breasts in a pan and then smothered them with this sauce. We had that on a salad with other traditional taco fixings like tomatoes, avocado, cilantro and more. It was a really great way to repurpose this healthy queso dip. Changes I would make: None are necessary! Feel free to change the spices to your liking. The recipe as written isn’t overly spicy so go ahead and kick it up a notch if that’s your style. Actual nutrition may vary depending on how recipe is prepared. 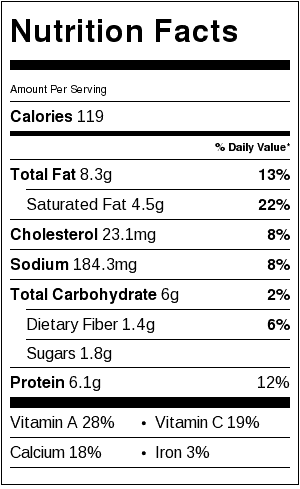 Nutritional information does not include chips. You clever girl, you! 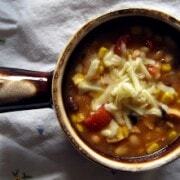 I’m always looking for ways to use up the squash I grow and we love Mexican food. I can’t wait to try this! Woah this sounds awesome! I’ve never seen frozen butternut squash puree, I’ll keep an eye out. Pinned! 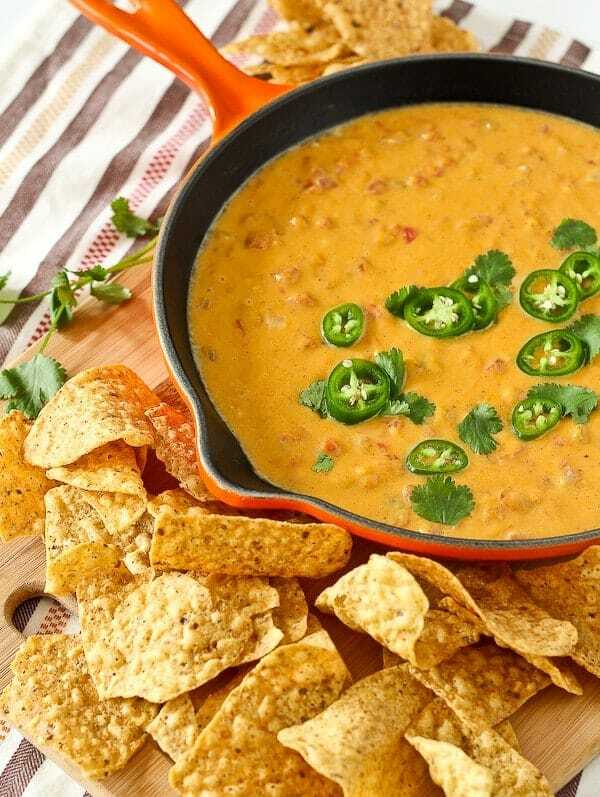 I’m all about this lightened up version of queso dip! I’ve had the idea to use cauliflower in something similar for awhile now but never got around to it. Totally trying this out! i want to do a swan dive into this dip and eat my way out! I’m intrigued. This sounds SO delicious. I’ve never met a cheese dip that I didn’t like. Pinned to try! this is freaking brilliant!!! making this! I am totally down with adding butternut squash. This looks amazing and I can’t wait to try it!! Oh my goodness, I cannot wait to try this recipe! I was just introduced to queso when I moved to Texas a few months ago, but its obviously not very macro-friendly. 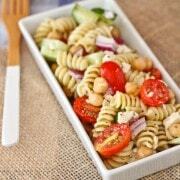 This looks delicious and a lot healthier! I’m thinking about making this for a gathering soon! Is frozen butternut squash puree typically available in normal grocery stores? Where did you get yours?? I find it in normal grocery stores! I’ve bought it at Kroger and Meijer both. I absolutely love the idea of using butternut squash in this queso… Pinned, shared, and so on the list of things to enjoy soon! Thanks! Can I used fresh butternut squash and instead the frizen?